When fall rolls around each year, I find we eat a lot of winter squash. It is so versatile, and can be used in everything from soups and salads to desserts, tastes terrific and is packed full of nutritional value. Winter squash such as pumpkin gets its antioxidant and anti-inflammatory properties from beta-carotene and high values of vitamin C.
Winter squash such as pumpkin can be kept for several months in a cool, dark place. Here in Italy, there is no such thing as pumpkin puree in a can, so I roast edible pumpkins in the oven, then puree and strain the pulp to remove excess liquid. To roast, cut the squash into halves or quarters, scoop out the seeds, and place on an oiled baking sheet in a preheated 400 degree oven for about 30 to 40 minutes or until the flesh is fork tender. Allow to cool, then use a spoon to scoop out the flesh. If using as a puree, pulse in a food processor until smooth, then place in a strainer above a bowl to allow the excess liquid to drain before using. This French Toast recipe turned out so well, I had a hard time not eating every bite myself. The pumpkin puree and spices added sweetness, and the multigrain bread I chose kept it from getting too soft. I cannot buy egg substitutes here in Italy, but feel free to use Egg Beaters or another egg substitute if you prefer. Because the pumpkin and spices added so much flavor on their own, you could simply serve this with a scoop of apple sauce, or a dollop of Greek yogurt and a little dusting of more ground cinnamon. Replacing some of the whole eggs with egg whites reduces the calories from fat. Winter squash such as pumpkin is high in antioxidants, vitamin C, potassium, vitamin B6 and fiber. 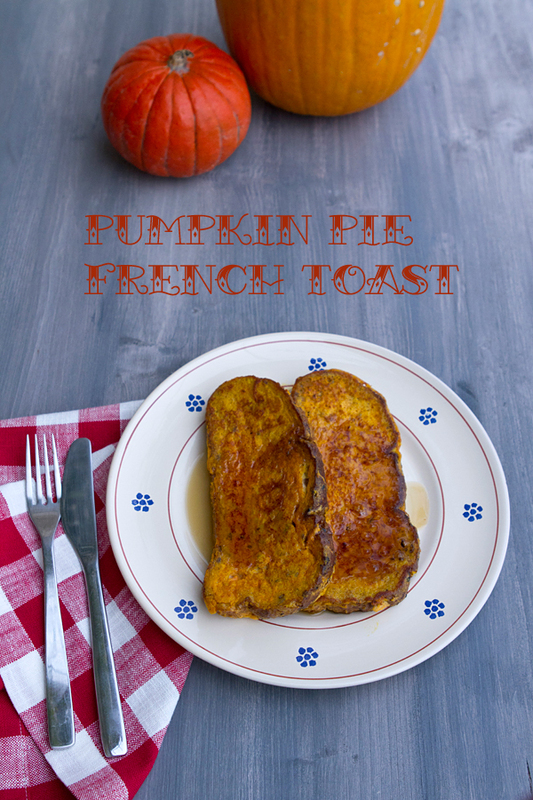 Using pumpkin puree and spices adds natural sweetness so little or no maple syrup is needed. Whole grain bread replaces regular bread adding fiber and other nutrients. In a shallow bowl, beat together the eggs, egg whites, pumpkin puree and spice, and milk. Spray a non-stick skillet with olive oil spray and heat to medium. Dredge the bread slices in the pumpkin egg mixture on both sides, allowing excess to drip back into the bowl. Place two or three bread slices in the preheated pan (as many as fit) and cook for about 2 minutes or until lightly browned. Turn, and cook the other side in the same manner. 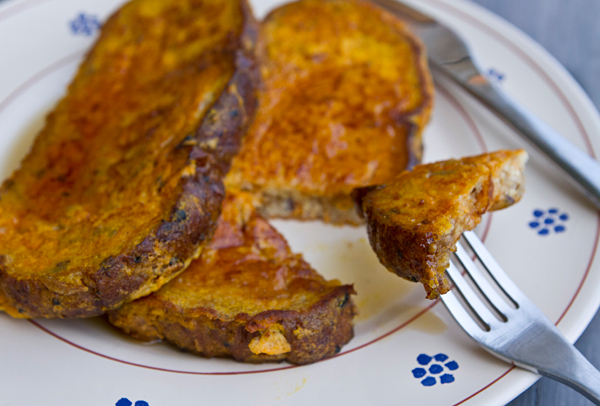 Keep the French toast warm and continue to cook the remaining bread slices in the same manner.